ReutersThe Syrian Observatory for Human Rights said Syrian government warplanes dropped barrel bombs on rebel-held areas of Hama province on Tuesday, a day after the United States said their use could lead to further U.S. strikes in Syria. Turkish Foreign Minister Mevlut Cavusoglu said on Tuesday that Ankara's findings showed the Syrian government still possessed chemical weapons capacity and urged for measures to prevent its potential usage. Speaking to state-run broadcaster TRT Haber in Italy, Cavusoglu also said a transition government was urgently needed in Syria and that risks of chemical weapons would continue as long as Syrian President Bashar al-Assad remained in power. Reuters UKU.S. President Donald Trump is open to authorizing additional strikes on Syria if its government uses chemical weapons again or deploys barrel bombs in the country, the White House said on Monday. Reuters UKIt's the dead children that still haunt Abu Ghassan, who was blinded for more than a month and paralysed for weeks by a nerve gas attack four years ago in a Damascus suburb. He recovered; 37 members of his family were among the hundreds of dead. Reuters UKBritish Prime Minister Theresa May spoke on Monday to U.S. President Donald Trump and agreed that "a window of opportunity" exists to persuade Russia to break ties with Syrian President Bashar al-Assad, May's office said. Reuters UKThe Group of Seven major global powers will be joined by Middle East allies on Tuesday in a push to isolate Syrian President Bashar al-Assad, hours before the U.S. secretary of state flies to Moscow, Assad's top backer. Russia's Foreign Ministry said in a statement on Monday that the missile strike on Syria carried out by the United States was a aggressive act against a sovereign state and violated international law. The statement was released after a phone call between Russia's foreign minister Sergei Lavrov and his Iranian counterpart Mohammad Javad Zarif. Britain is in discussions with international partners on how it can put more pressure on the Syrian government and its supporters, including Russia, Prime Minister Theresa May's spokesman said on Monday. The comments come as foreign ministers from the Group of Seven major industrialised nations met on Monday for an annual gathering which is expected to be dominated by questions over U.S. and Russian involvement in Syria after a poison gas attack which killed more than 70 people last week. Asked about the possibility of additional sanctions on Russia, the spokesman said: "We are in discussions with our key partners on how we can bring further pressure to bear on the regime and those who are backing it, which includes the Russians." He also said that May spoke with Canadian Prime Minister Justin Trudeau on Sunday evening to discuss the situation in Syria, and the pair agreed on the need to build support for a political solution to end the conflict. Kremlin spokesman Dmitry Peskov told reporters on Monday that U.S. Secretary of State Rex Tillerson was not due to meet Russian President Vladimir Putin when he visited Moscow later this week. He will meet Russian Foreign Minister Sergei Lavrov however, Peskov said. Commenting on U.S. missile strikes against Syria last week, Peskov said the action had shown Washington's total unwillingness to cooperate on Syria. He said renewed calls for Syrian President Bashar al-Assad to step down would not help to resolve the crisis. "There is no other alternative," to peace talks in Geneva and Astana, Peskov said. Reuters UKOil prices rose on Monday, supported by strong demand and uncertainty over the conflict in Syria, although another run-up in U.S. drilling activity kept a lid on gains. ReutersAhmad Mustafa fled northern Syria to Turkey four months ago, badly injuring his hand along the way. 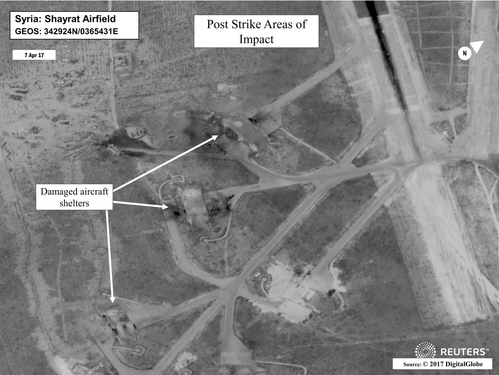 ReutersA U.S. cruise missile attack on a Syrian air base may persuade President Bashar al-Assad to be more cautious with some of his tactics, but will not deter him and his allies from pressing a full-throttle military campaign to crush rebels. Reuters UKForeign ministers from the Group of Seven major industrialised nations meet on Monday for an annual gathering, with Europe and Japan seeking clarity from the United States on an array of issues, especially Syria. In a secure room at his Mar-a-Lago estate in Florida, President Donald Trump's top military advisers presented him with three options for punishing Syrian President Bashar al-Assad for a poison gas attack that killed dozens of civilians. 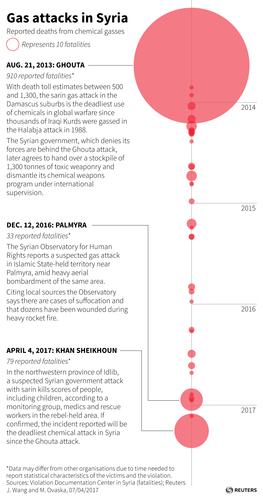 For many supporters of U.S. President Donald Trump, his decision to bomb a Syrian airfield in retaliation for a poison gas attack was a decisive show of strength and resolve - just what they voted for in November. Syrian-Americans on Friday hailed the U.S. missile attack on a Syrian air base as a blow for human rights, but said they were wary of both President Donald Trump's motives and what comes next. 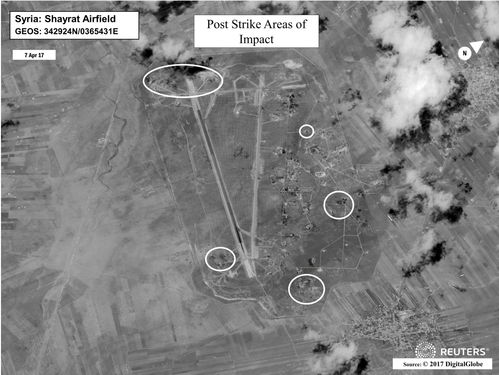 Russia warned on Friday that U.S. cruise missile strikes on a Syrian air base could have "extremely serious" consequences, as President Donald Trump's first major foray into a foreign conflict opened up a rift between Moscow and Washington. "Now America has come and wants to defend us. Is Trump a friend? I don't know. But hopefully something good will come from him, and there will be a (peace) agreement, and this corrupt regime which slaughtered people can be gone." - Qadi Hajj Qadur, a Syrian man interviewed by Reuters. Read more. 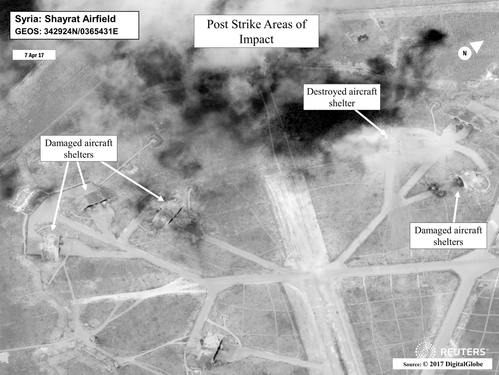 Polarized by years of civil war, Syrians were split on Friday over a U.S. strike on a government airbase, with those in rebel-held areas cautiously welcoming it but Damascus residents decrying it as Western aggression. Commentary: Is Syria strike the beginning of a ‘Trump doctrine’? JUST IN: In joint statement, Argentina, Chile, Colombia, Mexico, Paraguay, Peru and Uruguay condemn use of chemical weapons in Syria, express concern about rising violence there. U.S. Ambassador to the U.N. Nikki Haley, Russia's Vladimir Safronkov and Deputy Ambassador Mounzer Mounzer of Syria trade barbs in a Security Council meeting over the U.S. cruise missile strikes in Syria.